Tis the season to take stock of our lives, consider our shortcomings, and promise to do and be better next year. This annual exercise in self-flagellation used to be called “making New Year’s resolutions.” That fell out of fashion because people realized they were making promises they couldn’t keep. Now, we make intentions or summarize our desires for the upcoming year in a keyword or phrase because that seems like a kinder form of self-deception. Admittedly, I’m a little salty because 2018 didn’t turn out the way I hoped. I got neither the book contract or the handsome guy who shares my love of baseball, warm chocolate chip cookies, and old school hip-hop. I’m facing the coming year while working on the third revision of the book proposal and dateless on New Year’s Eve. I have been simmering in low-grade anger during the past year when it comes to national news events as well. I’m angry that Congress has failed to enact sensible and effective gun control laws despite more than 300 mass shootings have happened this year, depending on the estimates. How can people claim the United States is the “greatest country on earth” when immigrant children on the border will spend the holidays in cages? Finally, no matter where you fall on the political spectrum, allegations of collusion with the Russian government at the national level are more than a little unsettling. Given these personal disappointments and national calamities, how can we face the coming year with clear-eyed optimism? There’s a forced sense of optimism infecting American culture, especially for women. We’re expected to smile through heartbreak. We treat the declining health of an aging parent or the loss of a job as if it were a cold we must “power through.” We sacrifice our anger to the altar of “love and light.” We rush for the lesson to lessen the pain. Sitting with agony is challenging, but we must do it if we want to discover the gifts of our wounds. Pause the next time you experience anger, disappointment, loss, or sadness. If you cannot pause in that moment, schedule a five-minute break. Take three deep breaths during that time and feel the place in your body where you are experiencing the emotion. Do you feel it in your stomach, back, throat, or knees? Spend 30 seconds feeling the emotion in your body. Like a fire, let the emotion burn cleanly down to its embers. Allow yourself to feel the fullness of the emotion without dismissing or ignoring it. Ask the emotion, “what do you want?” Sometimes the answer is, “I just want to stop hurting.” That’s okay. You don’t have to make any decisions or act. Just feel the emotion. Thank your emotion for giving you vital information. Take three, deep breaths and go. You can also do this exercise with positive emotions. Using the same five minutes, start with three deep breaths and feel the place in your body where you feel excited. Ask your happiness, joy, gratitude, aliveness what it wants. It might say, “to sing in public” or “knit more.” Thank your positive emotion for showing up. Take three, deep breaths and let go. When we meet the moment as it is, we no longer have to store our desires and shortcomings in a basket to sort through at the end of the year. We can be guided by our goals and intentions, but not controlled by them. We can plan for the future, do our best, and meet each moment as it comes with curiosity and openness. Instead of treating the universe as a short order cook, we can invite it to the table and break bread. 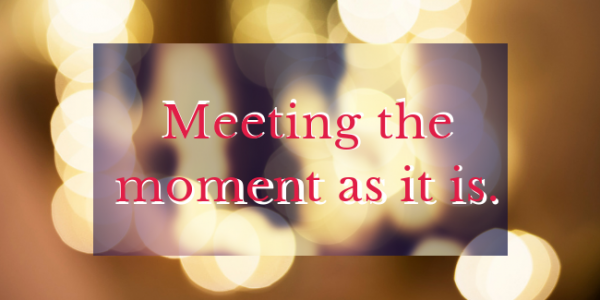 Meeting the moment as it is reveals a new pathway to self-love. 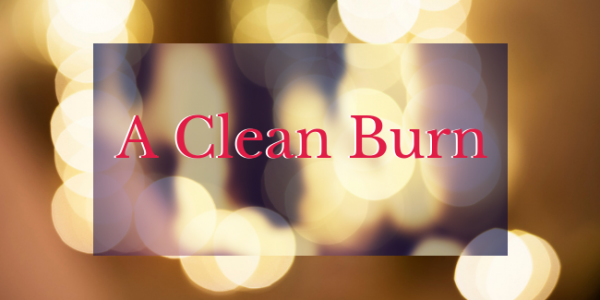 Our best self is not a resolution or intention, but a divine spark that has been lit within all year long.